It’s common knowledge that the Army completes some missions with the help of dogs. Books, movies, and TV have admiringly aired the feats of those four-legged “K-9 unit” warriors from World War II down through the present. Much less well-known, though, is that the Navy relies on some animal volunteers, too—namely, dolphins, whose ingrained navigational skills outdo even the most sophisticated submarine systems on the planet. Two Navy dolphins earned high marks of praise for unearthing a 128-year-old Howell torpedo in the waters off Coronado, California. The finding is remarkable not only because of the artifact’s age, but also because of the odds of finding one at all: Only 50 of this torpedo were ever made. The Navy has been training and deploying hundreds of dolphins and some sea lions since the 1960s to detect and clear underwater mines, identify enemy divers, and guard friendly swimmers. The pair who made this historic torpedo find were among 80 dolphins and 40 sea lions who were trained at a Navy’s facility in Point Loma facility in San Diego. 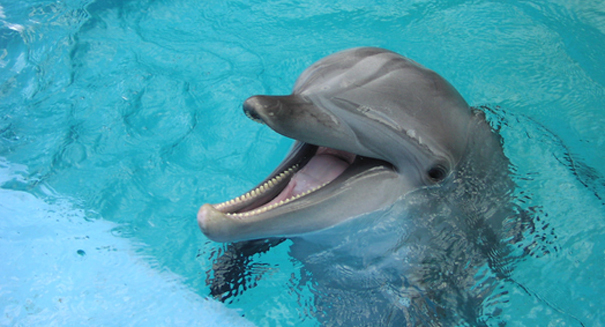 Dolphins possess a natural sonar capability. They navigate through often extremely murky and opaque waters by making clicks and whistles, and as those sounds resonate through the water, their sound waves bounce off of other objects or the sea floor below and ricochet back. The dolphins’ brains interpret the returning sound waves to figure out what lies ahead of them in any direction and whether it is food, a friend, or a foe. Navy trainers teach dolphins to use this sonar for identifying waterborne objects that Navy personnel would want to avoid, such as mines, and then put the trained swimmers to work. When the United States invaded Iraq in 2003, dolphins were flown in to patrol the Persian Gulf waters for combatants and for mines. Other dolphin teams currently help guard submarine bases in Georgia and Washington state, and yet another dolphin unit will deploy this fall to hunt for mines in the waters of Croatia. Little did any Naval dolphin trainer expect that their cadets might turn out to have a knack for tracking down historical treasures, as well. This newly found Howell torpedo, underwater since 1885, was a technological marvel of its time that could travel undetected through 400 yards of water at a time. Now confirmed as the 24th of the 50 Howells ever produced, and certified as completely defective as a result of its extended stay underwater, the piece will now stay at the Naval Undersea Museum in Keyport, Washington.